if you've been around long enough, and have the wherewithal to put bits of bikes together, as well as taking them apart, you will perhaps have a reasonable perspective on what isn't what it used to be. have no fear, i am not about to launch into an endless diatribe about why stuff doesn't need to be changed because there was nothing wrong with it in the first place (though if anyone asks...) this is more about adaptability. as i was fortunate enought to be asked recently for the pages of rouleur, the transmission duties at the rear of the bicycle were originally taken care of by the freewheel, increasing its versatility from an original three differently sized sprockets up to a maximum of eight, before the weight of shimano's cassette took over. keen to be the biggest kids on the block, campagnolo have topped this out at eleven, and are keen to underline that, for the time being, that's where it stops. 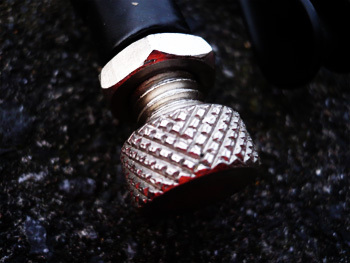 if we consider the space between the hubshell and the frame dropout to be of finite measurement (based on the current standard of 130mm on road bikes and 135 on mountain bikes), making space for those extras has to obey the laws of causality somewhere along the line; aside from sprockets becoming thinner, the chain has to do the same. all well and good in a sense; we have now moved on from one size fits all, to requiring specific chains for each vitesse increase at eight, nine, ten and eleven. 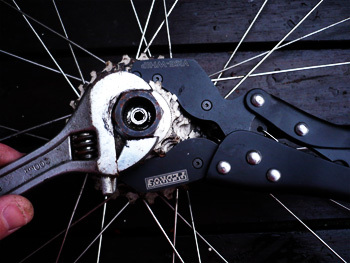 were it not that i wish to maintain a degree of style and decorum in these paragraphs, i'd let you know what one of my correspondents said on discovering the cost of a campagnolo eleven-speed chain tool. freewheels obeyed the laws of brute force and ignorance, depending, of course, on which particular flavour of sprockets affixed to the hub thread. not that they exist anymore, but what the heck were suntour thinking of with the two and subsequently four notch remover? breakage, skinned knuckles and foul language perhaps sounded better in japanese. but there were still those contra-rotational forces with which to contend; there was simply no other way for those little spring-loaded pawls to behave, if it pedalling was to be life's sole focus for at least an hour or two. let me state the obvious: forward motion can only be gained if those pawls engage in the inner serations comprising the standard freewheel or freehub mechanism. freewheeling flattens the pawls into their little sockets, thus allowing the sprockets to revolve anti-clockwise unhindered. with the mechanism built into a freewheel, removal needed no outside assistance other than a musculature similar to schwarnold arzenegger; or a big vice. freehubs and cassettes present an altogether different problem, with the freewheeling mechanism built into the hub. pop the appropriate remover into the lockring to unscrew and the more astute amongst you will have seen the problem coming from miles away. thus an appropriate immoveable force is required to keep the sprockets from freewheeling, and up till now, that force has been cheerfully provided by the excitingly named chain whip. but there is, in my case at least, a fly in the ointment. cast your minds back to my opening statements about ever increasing sprockets and thinning of same; thinner chains. being a moaning old git, reluctant to splash out on quality tools everytime someone decides that what was good enough before is no longer good enough for now, the chainwhip occupying the appropriate hook on thewashingmachinepost tool board, features a chain more comfortable with five sprockets than the eleven featured on the recently reviewed colnago m10. you'd think that the forward march of technology would have replaced such a rudimentary and rustic tool with something more contemporary. however, before i introduce the saviour of those knuckles and japanese swear words, i feel i must point out an anomaly in thewashingmachinepost chain whip referred to only a few moments ago. 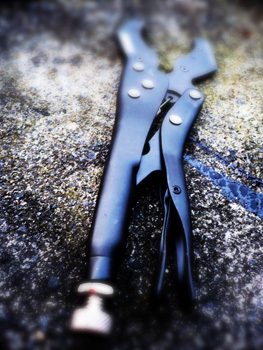 this sturdy piece of equipment, featuring a decent length of chain and a rubber clad tubular handle, also has a suitably shaped cutout that would easily slip over the hexagonal end to a cassette removal tool. but if we assume that the chain is already in place, wrapped round a set of sprockets, how on earth was one supposed to employ the cutout? no, me neither. anyway, back to my man pedro. 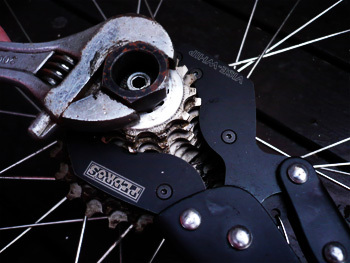 in a feast of lateral thinking sometimes seen in the bicycle tool industry, the chain whip has been replaced with a vice grip, but a vice grip with jaws that are designed to grasp sprocket teeth. no more footering with an incorrectly sized chain (for remember, if suitably sized for ten speed, the chain whip would have little purchase on an eight speed); the procedure now consists of placing the splined cassette remover into the lockring and grasping with an adjustable spanner, then grasping the sprockets with pedro's vise whip, and bob is indeed, your uncle. while not an operation i have cause to repeat frequently, a recent multiple swap of wheels between review bikes meant a game of musical cassettes, greatly eased with assistance from pedro. we are, of course, talking workshop quality here, so the price is a reflection of the quality provided, and it is a tad more expensive than a similar quality chain whip, but considering the ease with which the sprockets were removed in each case, i'd consider it money very well spent, particularly since my knuckles are all perfectly intact.